Bu araştırmanın amacı Wechsler Çocuklar için Zekâ Ölçeği (WÇZÖ) IV Türkçe formundaki maddelerin sosyo-ekonomik düzey ve cinsiyete göre işlev farklılığı gösterip göstermediğinin, birden fazla yöntemle incelenerek birbiri ile uyumlu sonuçlar verip vermediğinin ortaya konulmasıdır. Araştırmada WÇZÖ-IV Türkiye Uyarlama ve Standardizasyon Çalısmasına ait 819 kişilik ön uygulama verileri kullanılmıştır. Çalışma WÇZÖ-IV’ün çoklu puanlanan maddelerden oluşan Küplerle Desen, Benzerlikler, Sayı Dizisi, Sözcük Dağarcığı, Harf-Rakam Dizisi, Kavrama alttestleri ve ikili puanlanan maddelerden oluşan Resim Kavramları, Mantık Yürütme Kareleri, Resim Tamamlama, Genel Bilgi, Aritmetik, Sözcük Bulma olmak üzere toplam 12 alttest ve bu alt testlerde yer alan 315 madde üzerinden yürütülmüştür. Maddelerin işlev farklılığı içerip içermediğine karar vermek için ikili puanlanan maddeler açısından Rasch Modeli, Mantel‐Haenszel, SIBTEST yöntemleri, çoklu puanlanan maddeler açısından da Kısmi Puan Modeli, Mantel Test ve Poly-SIBTEST yöntemleri kullanılmış ve 12 alt test açısından madde işlev fonksiyonu içeren maddeler belirlenmiştir. Araştırmada kullanılan MİF belirleme yöntemleri incelendiğinde, genel olarak yöntemlerin birbiriyle tutarlı sonuçlar verdiği ancak cinsiyet açısında MİF içeren maddelerin tespitinde Mantel-Haenszel, SIBTEST ve Mantel Test, Poly-SIBTEST istatistikleri daha tutarlı sonuçlar verirken sosyoekonomik düzeye göre MİF içeren maddelerin tespitinde Mantel-Haenszel, Rasch Modeli ve Mantel Test, Kısmi Puan Modelinin daha tutarlı sonuçlar verdiği saptanmıştır. Ackerman, T. A., Evans, J. A. (1992). An investigation of the relationship between reliability, power, and the Type I error rate of the Mantel-Haenszel and simultaneous item bias detection procedures. Annual Meeting of the National Council on Measurement in Education, San Francisco. Adams, R.J., Rowe, K.J., (1988). Test Bias In Educational Teearch, Methodology, and measurement: an International Handbook (Eds. J. Keeves), Oxford: Pergamon Pres p. 398-403. Atalay, K., Gök, B., Kelecioğlu, H., Arsan, N. (2012). Değişen madde fonksiyonunun belirlenmesinde kullanılan farklı yöntemlerin karşılaştırılması: Bir simülasyon çalışması. Hacettepe Üniversitesi Eğitim Fakültesi Dergisi, 43, 270- 281. Awuor, R. (2008). Effect of Unequal Sample Sizes on the Power of DIF Detection: An IRT-Based Monte Carlo Study with SIBTEST and Mantel-Haenszel Procedures. Unpublished doctoral dissertation, Virginia Polytechnic Institute and State University Blacksburg, Virginia, US. Bond, T.G., Fox, C.M. (2001). Applying the Rasch Model: Fundamental Measurement in the Human Sciences. New Jersey: Lawrence Erlbaum Associates Publishers London. Bond, T.G., Fox, C.M. (2007). Applying the Rasch Model: Fundamental Measurement in the Human Sciences. Second Edition. New Jersey: Lawrence Erlbaum Associates Publishers London. Camili, G., Shepard, L. A. (1994). Methods for identifying biased test items. London: Sage publications. Camilli,G., Shepard, A. L. (1994). Methods for Identifying Biased Test Items, London, International Educational and Professional Publisher, Sage Publications. Chang, H., Mazzeo, J., Roussos, L. (1996). Detecting DIF for polytomously scored items: An adaptation of the SIBTEST procedure. Journal of Educational Measurement, 33(3), 333-353. Clauser, B. E., Mazor, K. M. (1998). Using statistical procedures to identify differential item functioning test items. Educational Measurement: Issues and Practice, 17, 31-44. Cronbach, L. J. (1990). Essentials of Psychological Testing (5. Baskı), New York: Harper Collins Publishers. Embretson, S. E., Reise, S. P. (2000). Item Response Theory for Psychologists. Mahwah,NJ: Erlbaum. Gierl, M. J., Jodoin, M., Ackerman, T. (2000). Performance of Mantel-Haenszel, simultaneous item bias test and Logistic Regression when the proportion of dif items is large. Paper presented at the Annual Meeting of the American Educational Research Association, New Orleans, Louisiana, USA. Hambleton, R. K. (2005). Issues, designs, and technical guidelines for adapting tests into multiple languages and cultures. Hambleton, P. F. Merenda, & C. D. Spielberger (Ed. ), Adapting educational and psychological tests for cross-cultural assessment (pp. 3-38). Mahwah, NJ: Lawrence Erlbaum. Hambleton, R. K., Swaminathan, H., and Rogers, H. J. (1991). Fundamentals of Item Response Theory. CA: Sage. Henderson, D. L. (1999). Investigation of differential item functioning in exit Examinations across item format and subject area. Unpublished doctoral dissertation, University of Alberta, Edmonton, Alberta, Canada. Holland P.W., Wainer H. (1993). Differential Item Functioning. Hillside. New Jersey: Lawrence Erlbaum Associates. Publishers. Holland, P. W., Thayer, D. T. (1988). Differential item functioning and the Mantel- Haenszel procedure. In H. Wainer & H. I. Braun (Ed. ), Test validity (129– 145). Hillsdale, NJ: Lawrence Erlbaum Associates. Horst, P. (1966). Psychological Measurement and Prediction. Belmont: Wadsworth Pub. Co. Institute for Education Research. Kamata, A., Vaughn, K. B. (2004). An Introduction to Differential Item Functioning Analysis. Learning Disabilities: A Contemporary Journal 2(2), 49-69. Mantel, N. (1963). Chi-square tests with one degree of freedom: Extension of the Mantel-Haenszel procedure. Journal of the American Statistical Association, 58, 690-700. Mantel, N., Haenszel, W. M. (1959). Statistical Aspects of the Analysis of Data from Retrospective Studies of Disease. Journal of National Cancer Institute, 22, 719- 748. Mellenberg, G. J. (1983). Conditional item bias methods. In S. H. Irvine and W. J. Barry (Ed. ), Human assesment and cultural factors (pp. 293–302). New York: Plenum Pres. Mellor, T. L. (1995). A comparison of four differantial item functioning methods for polytomously scored items. Unpublished doctor dissertation. The university oftexas Austin. Murphy, K., Davidshofer, C. (1994). Psychological testing: Principles and applications (3.Baskı). Englewood Cliffs, NJ: Prentice Hall. Narayanan, P., Swaminathan, H. (1996). Identification of items that show nonuniform bias. Applied Psychological Measurement 20(3), 257-274. Osterlind S. J., Everson H. T. (2009). Differential Item Functioning: Second Edition. California: SAGE Publications. Inc.
Öktem, F., Gençöz, T., Erden, G., Sezgin, N., Uluç, S. (2013). Wechsler Çocuklar İçin Zeka Ölçeği-IV (WÇZÖ-IV) Uygulama ve Puanlama El Kitabı Türkçe Sürümü. Türk Psikologlar Derneği Yayınları, Ankara. Raju, N. S. (1990). Determining the significance of estimated signed and unsigned areas between two	item response	functions. Applied Psychological Measurement, 14, 197–207. Reynolds. C. R., Livingston R. B., Willson V. (2006). Measurement and Assessment in Education. Chapter 16: The Problem of Bias in Educational Assessment. Boston: Pearson Education. Inc.
Rodney. G. L., ve Drasgow, F. (1990). Evaluation of two methods for estimating item response theory parameters when assessing differential item functioning. Journal of Applied Psychology. 75, 164‐ 174. Rogers, H. J., Swaminathan, H. (1993). A comparison of logistic regression and Mantel- Haenszel procedures for detecting differential item functioning. Applied Psychological Measurement, 17, 105-116. Roussos, L. A. (1992). Hierarchical agglomerative clustering computer program user’s manual. University of Illinois at Urbana-Champaign. Roussos, L. A., Stout, W. F. (1996). Simulation studies of the e ects of small sample size and studied item parameters on SIBTEST and Mantel-Haenszel type I error performance. Journal of Educational Measurement, 33, 215-230. Shealy, R., Stout, W. (1993). An item response theory model for test bias and differential test functioning. In P. Holland & H. Wainer (Ed. ), Differential item functioning (197–240). Hillsdale, NJ: Earlbaum. Shepard, L. A., Camilli, G., Williams, D. M. (1984). Validity of approximation techniques for detecting item bias. 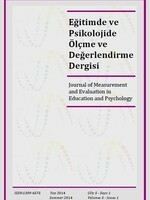 Journal of Educational Measurement.22, 77–105. Thorndike, R. L. (1982). Applied psychometrics. Boston: Houghton Mifflin Company. Tittle, C.K. (1988). Test Bias In Educational Teearch, Methodology, and measurement: an International Handbook (Ed. J. Keeves), 392- 398.Pergamon Press: UK. Ulutaş, S. (2012). PISA 2006 Fen Okuryazarlığı Testindeki Maddelerin Yanlılık Bakımından Araştırılması. Yüksek Lisans Tezi, Ankara Üniversitesi Eğitim Bilimleri Enstitüsü. Uttaro, T., Millsap, R. E. (1994). Factors in uencing the Mantel-Haenszel procedure in the detection of differential item functioning. Applied Psychological Measurement, 18, 15-25. Vijver, F. Poortinga, Y. (2005). Conceptual and Methodological Issues in Adapting Tests. Hambleton, P. F. Merenda, & C. D. Spielberger (Ed. ), Adapting educational and psychological tests for cross-cultural assessment (pp. 39-63). Mahwah, NJ: Lawrence Erlbaum. Zumbo, B. D. (1999). A Handbook on the Theory and Methods of Differential Item Functioning(DIF): Logistic Regression Modeling as a Unitary Framework for Binary and Likert-Type (Ordinal) Item Scores. Ottawa, ON: Directorate of Human Resources.Research and Evaluation, Department of National. Zumbo, B. D. (2007). Three generations of DIF analyses: Considering where it has been, Where it is now, and Where It Is Going. Language Assessment Quarterly, 4(2), 223-233.